The half empty glasses of milk and the cold toast still on the breakfast table triggered a sudden fear in Robert Pretty when he came home from work. He heard water dripping in the front bathroom of his north Houston home. R.Pretty told police that he knew something was terribly wrong. 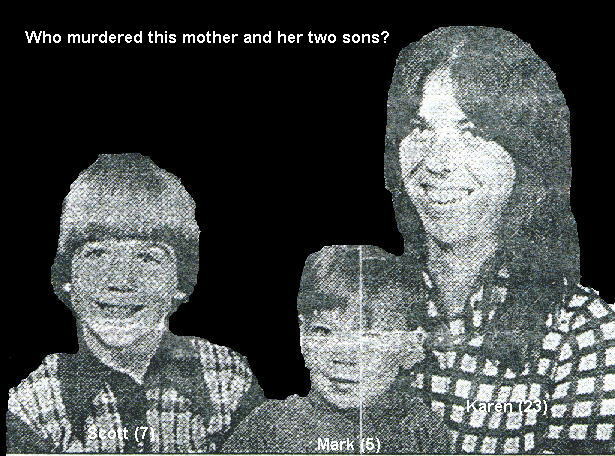 R.Pretty said he found the lifeless bodies of his sons, Scott,7, and Mark,5, in the bathtub. They had apparently drowned after being shoved face down in the water. He pulled his children from the water, then ran to the other bathroom, near the master bedroom. In a bathtub was the body of his wife, karen,28, still wearing her flowered bathrobe.Her hands and feet were bound with telephone cord. The county medical examiner ruled that the deaths were from a combination of strangulation and suffocation by drowning. It appeared that they were held under water. Dr.Joseph Jachimezek said. A telephone cord was around the mothers neck, he said. The boys had alson been strangled with bare hands. Mark, 5, had been beaten by his assailant. There death would have been very slow and agonizing. The main clue in the three deaths was the family's 1978 Mercury Marquis, which was found in an unassigned parking space at an apartment house at 198 Goodson Dr. The house had not been robbed and only one drawer was open. according to detectives they were not sexually molested either. This murder occurred May 10.1978 in Houston, Texas. It has been said that this may have been a hit intended on another family. Apparently there was an informant in the neighborhood who caused the arrest of a known drug dealer.Last heard, this known drug dealer, Anthony, was deceased. The people who committed this crime may be fromanother state.This would explain them getting the wrong house. This is just a theory. There may be another answer. If you have heard or know anything that may bring this case to a close please contact one of the numbers below. You may do this anonomiously!!!! The family of the victims has suffered for 20 years now. the way those babies were killed and still in their pajamas is the work of a coward! !